Ursula was not allowing photographs at this event but she made an exception for me, and Graham Rye took this photograph of us. This was the first time I had met Graham, who publishes the 007 Magazine. There is a link below to their website, and everyone who is interested in James Bond should visit it. I now have two photographs, two Jeff Marshall lithos and also my Bond Girls book signed by Ursula . 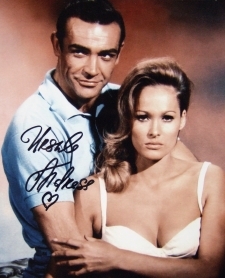 One of my most memorable 'Bond moments' was the time I met Ursula Andress at Autographica in London, in October 2005. I had dressed in my tuxedo to look like 007 and she asked me why I was looking so smart. When I said that it was because I was meeting her, she told me how pleased that made her feel! 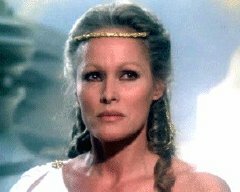 Ursula Andress was born of German parents in Ostermundigen in the Swiss canton of Bern on March 19, 1936. Blessed with stunning good looks, she started her film career with small roles in several Italian farces in 1955. With the help of Marlon Brando, she later signed a contract with Columbia Pictures, and moved to America. novel. She won a Golden Globe award for this in 1964. In Dr No, Ursula's accent was thought to be too strong so her speech was dubbed by Monica Van Der Syl, and her singing by Diana Coupland. The moment when she comes out of the sea carrying a large shell is one of the most famous scenes in the history of film. Italian-style 'pop-art' film The 10th Victim (1965). She also appeared again with Sellers in the spoof Bond film Casino Royale (1967) playing the occasional spy Vesper Lynd. and Mountain of the Cannibal Gold (1978) a horror thriller co-starring Stacy Keach. After the film Clash of the Titans (1981), Ursula scaled back her career, focussing more on European TV, including mini-series Peter the Great (1986). Ursula Andress married actor/director John Derek in 1957 but the marriage ended in an amicable divorce in 1966. She later dated many of Hollywood's leading men including co-stars Sean Connery, Marlon Brando and James Dean. In 1981, she had a son, Dimitri, with American actor Harry Hamlin, her co-star in the film Clash of the Titans (1981). I met her again in September 2009, and I had another photo taken with her (see below).